Squirrels belong to a large family (Sciuridae) of small or medium-sized rodents. The family includes tree squirrels, ground squirrels, chipmunks, marmots (including woodchucks), flying squirrels, and prairie dogs. 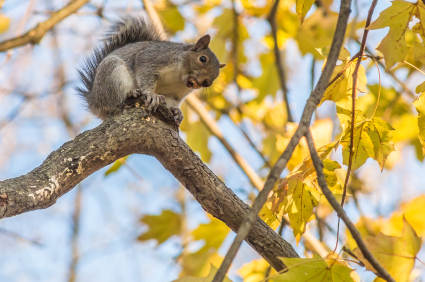 Squirrels are indigenous to North and South America, Europe, Africa and Australia, and on rare occasions have been known to invade houses and out-buildings; often creating a pest control problem for unsuspecting homeowners. Although the Eastern Grey squirrel, or Grey squirrel, is the most common species in North America, squirrels live in almost every habitat from tropical rainforest to semiarid desert; only avoiding the coldest polar regions and driest desert areas. In temperate regions, the early spring is the most difficult time of year; for many squirrels. Buried nuts begin to sprout, and as such, are no longer available for consumption. As well, replacement food sources have not yet been discovered. It is during this period, that the squirrel will depend heavily on the buds of sprouting trees; for nourishment. Throughout the rest of the summer months, the squirrels’ diet consists primarily of plant food, including nuts, seeds, conifer cones, fruits, fungi; and green vegetation. In some instances, squirrels may also consume meat, especially when faced with starvation. In fact, many species of squirrels will eat insects, eggs, small birds, smaller rodents and young snakes.